I Just Saw Some UFOs Flying Over Metro Detroit! No Joke! It’s not every day – or night – that one has a UFO experience, but tonight (Tuesday, October 27, 2015) was one of those nights for me. I just stepped outside to take out the garbage. I don’t know what urged me to look up and over my shoulder; but when I did, I saw three to four strange, pulsating and glittering white lights flying in a straight line across the sky, running roughly parallel to our condo. The were spaced roughly an equal distance apart and traveling in what appeared to be a straight line across the sky, headed due south. The lights were strange. I mean very strange. I’ve never seen any aircraft using this type of illumination before. The UFOs were using a bright white light that burst into a pointed star pattern similar to the pointed designs often found on compasses or drawings of snowflakes. They burst in a strobe-like frequency, yet they appeared more like a twinkling or glittering against the night sky. (I know this sounds strange, but it’s the best way I can describe it. When confronted with something so strange and unknown, I did what any man would do… I shouted for my wife. As she came out the door and I pointed to the sky to show her what I was seeing, the objects – which were already traveling at a speed visibly quicker than most aircraft – increased their speed. Within a matter of seconds, what was once flying over our condo community was now roughly over the neighboring city of Northville, which is a a few miles away. Note: I’m not saying that the UFOs picked up their speed because I saw them and hollered for my wife. This was likely a coincidence. By the time the lights were (estimated) over Northville, their formation changed from the straight line in which they were previously flying. As previously mentioned, they were headed due south, nearly parallel to Haggerty Road. In a visual experience that I can only compare to twisting the tube of a kaleidoscope, the straight line changed into a formation that was roughly in a triangle or even a square. (Similar to the picture.) I cannot stress enough how quickly this happened. I posted a shorter version of this on my Facebook page. Two of my friends from in and around Flint, Michigan already have told me that they saw something similar last night at about 11pm, and the night before around 1am. Also, my brother-in-law just told me that he thought he read somewhere that this area was supposed to be experiencing fighter jet patrols.The only evidence I found for that was this story, which reports that the training flight is scheduled for Thursday, October 29, 2015. Could I have seen fighter jets flying in a yet-to-be-reported training mission? Perhaps some A10 Warthogs from Selfridge Air Force Base being threatened for retirement? It’s possible. I make no claim to knowing or understanding the origins of what I saw tonight. All I can say is that they were unidentified flying objects in every sense of the term. At the risk of sounding like every slack-jawed yokel who claims to have seen a UFO, I will say that if these were planes, they were like no planes I’ve ever seen. It’s important to note that we live close to Detroit Metro Airport, so we get jets flying over our house all the time. In fact, four flew overhead at the end of tonight’s garbage run. As a matter of comparison, the strange lights I saw were traveling so fast that they made the known jets I saw look slow and cumbersome by comparison. Also, the lights were much different. I don’t tell everyone this, but tonight’s experience wasn’t the first time I’ve seen a UFO. I had a much closer encounter on April 2, 1992. The reason I know the date is because it was the day I got married to my first wife. Long story short, we were driving to Emporia, Kansas from Burlington, Kansas on a two-lane, rural highway. On the right, was a farmhouse with a gigantic cornfield. Hovering above that cornfield were four, circular lights that were glowing a bright but soft white. These lights cast no glare, and although I could not see what type of craft they were attached to, neither my then-wife nor I heard any sound although these lights couldn’t have been more than 50 feet off the ground. Having seen “Fire In the Sky: The Travis Walton Story” only weeks before, we were pretty freaked out by what we were experiencing. Other motorists on the road seemed to feel quite the opposite. The two cars ahead of us, and at least one driver behind us, pulled off to the side of the road to stare at this unidentified craft/lighter source. Me? I put the pedal to the metal and got the hell out of there! I haven’t seen anything cool, unfortunately, but wanted to chime in a bit. I’m not totally positive on what lights civilian aircraft use but imagine they aren’t dissimilar to what the military use and I worked on those for years. When flying they usually only have the wingtip lights on which are red and green, sometimes a small white light on the tail. The only bright white lights, like the ones it sound like you’re describing, point straight forward and are only used for landing. They wouldn’t be angled down where they would be visible from the ground. It’s a struggle to think of some logical reason why aircraft would be flying a formation and be lit up in that way. Crazy. Johnny: With Selfridge Air National Guard Base roughly 45 minutes away – and Detroit Metro Airport even closer – it’s in inconceivable that these could’ve been some type of military aircraft. Thing is, SAFB is due east of Novi and these craft were headed south. They could have been going to Wright-Patterson Air Force base near Dayton, Ohio. Who knows? 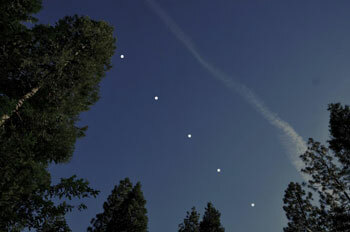 Like I said in the blog, these were UFOs in a very literal sense of the term. For sure! As to exactly what it was, I have no clue. The past 2 nights in a row now, I have seen something hovering in my area. I live in southwest Detroit in between downtown and Dearborn. The lights are spot on to the military description but I don’t see why they would be hovering but hey I don’t know anything about military missions and training. It’s around 1 AM ish every night. Last night it stayed much longer and slowly moves in a line almost the same way the moon moves through the night. I’ve seen these plenty of times but never as low as this one is. Looks more like an oval shape. Typical description. I know last year they spoke about it on the news, more towards the degree of the blog post. What I’m seeing also fits a documentary me and my brother once watched where NASA was being asked what ot could be and they could not even say. A few years ago, near the airport but still in the residential area my friend and I once seen a plane like an actual plane you fly, suspended in the air quite low basically just hovering there. We thought we we crazy so we drove around the block a few times and sat and watched and it didn’t budge or make any noises so I wouldn’t be surprised if it is something like the military but still pretty creepy. Wow! That is strange. And thank you for sharing this on my blog. If it happens again, could you get some video footage of the strange, hovering light? If you do, I’d be happy to host the footage here on my blog and discuss it. Maybe other people are seeing it? I would love to get people talking about these things. Can you help in these regards? I was driving on us 23 tonight and saw virtually the exact same thing you were describing. But there were a greater amount of lights… The moved so fast across the sky once the broke the formation they were in… Orange lights, not blink. I saw planes and they were no planes. They then hovered and just stayed, then eventually there was just one. They covered the night sky faster than any plane I have seen. This was virtually in the same area that you saw this. Wow! That is weird. Where were you on US-23? North or southbound? I used to work in Flint and I drove that highway every day. The only lights I’d ever seen were planes… and one time the people at Waldenwoods released a bunch of Chinese lanterns into the air. That was freaky for a minute until I realized what it was. Sounds like you saw something quite different. I saw three lights in formation last night and managed to get a short video. It was hovering over Detroit . 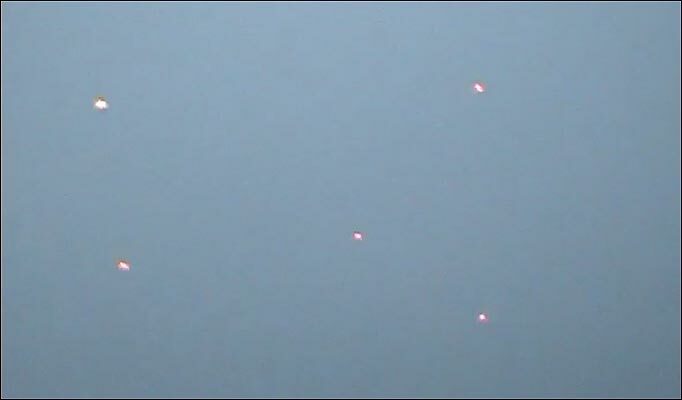 It appeared to be 3 lights in a triangle formation. I saw something like this aswell. I woke up at 3am to get myself some coffe and happened to look outside my window….then i noticed about twenty lights in the sky, so white that they were almost transparent. Then as i moved around they fled faster than i could move my eyes. I tried to take a video with my phone, but all i got was the sky…..it was as if they were invisible to my camera! I need to know what this is…if you have any idea reply thanks. What the F*@# Happened to Pizza? Seriously! Who Remembers the Arcade Game Called “Circus” from Back in the Day?